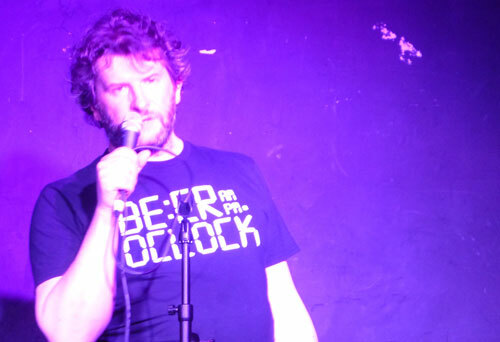 Having got a taste for going out on stage in front of a rowdy audience of (almost) complete strangers on Kate Smurthwaite’s City Academy courses, I followed up with another course with renowned stand-up comedy director, Chris Head. This was at the dedicated comedy pub, The Bill Murray, in Islington — part of the same management as the famous Camden Head. While I was doing the course in the upstairs room some big names in the comedy world (Nish Kumar, Daniel Kitson, etc.) were appearing on the stage in the room below — the stage which I graced myself in our end-of-course gig (see below). At the start of this year I did something I thought I’d never do — enrolled on a stand-up comedy course. And even more daunting than practicing and performing a few attempts at stand-up in a classroom situation in front of a tutor and other students was that the course included a ‘showcase’ performance for all the newbie students to perform their routines. Add into the mix that it was at a “real” comedy venue to a real audience. All this after a whole six weeks of study. My reasons for taking the course were partly logical and partly just a hell-of-it idea to push myself well out of my normal comfort zone. The logical justification was that I’d written short stories that had seemed to get a few decent laughs when performed by professional actors at Liars League. And, in general, my writing often has a habit of veering off in search of the humorous. So, in theory, it wasn’t a huge leap to try my hand at writing the sort of material that might work in some types of stand-up. The big problem was getting up and performing it. That’s where the comfort zone thing came in. Talk to most people and they’ll say one of their biggest fears is public speaking. If it’s public speaking without notes to an audience that might include hecklers who expect you to be funny then it’s ten times worse. Many people have told me that having a go at stand-up is their worst nightmare. In some ways stand-up is the opposite of writing — it’s performed in real-time, often with elements of improvisation, delivered in a uniquely personal style and involves direct interaction with an audience (unlike theatre, there’s no ‘fourth wall’). Writing distances the personality of the author, can be paused and re-read and is a solitary activity for the reader. Unsurprisingly, then, as a means of communication, writing often suits personalities on the introverted end of the scale, probably including me too. But there are also similarities. Along with attending the course, I’ve read a few books about stand-up technique and by stand-up comedians. Sara Pascoe in her recent book Animal (it defies categorisation as it’s part memoir, part biology/psychology, part humour) makes a perceptive point — both authors and stand-ups effectively tell their audiences/readers to sit down and listen to/read their words for a long period. They’re not conversations. In her words, they’re both about showing off. Both stand-ups and authors of books have a story they ‘re insisting on telling the audience. And as well as the general principle, many storytelling techniques are common to both genres, etc, etc. Well, that was the psychological lifebelt I was clinging to — as the showcase performance at the end of the course started to move closer. There are many stand-up courses available, taught in contrasting formats. The course I took was with City Academy (who do a lot of other courses in the performing arts, for actors/dancers/etc.) over six Monday nights, with the seventh week being the showcase. The tutor was (and remains) Kate Smurthwaite. Since doing the course I’ve seen Kate interviewed all over the place, often about gender and feminist issues. She’s been on Sky News and became internationally famous a few weeks ago for showing her unshaven armpits on This Morning. She also even achieved a high accolade from the perspective of some of the posts on this blog — by being a guest on the Jeremy Vine show on Radio 2. Besides her punditry in the media, Kate is also a professional comedian, touring her own shows and with writing credits such as Have I Got News For You. I found her a very broad-minded and supportive tutor, generating a rapport with all the students. She offered a good grounding in some of the practical aspects of starting off in stand-up comedy and provided positive, constructive feedback. The other students were a diverse bunch (in terms of humour, especially) yet it was amazing how quickly we built up a shared sense of camaraderie. Perhaps it was the shared prospect of being thrown to the hecklers in the end-of-course showcase that helped us bond? Or maybe the ‘loosener’ improvisation exercises during the class — after which nobody can remain a shrinking violet. There were some excellent budding comedians in the class. Each session was as entertaining as turning up to a comedy night in your own exclusive club. 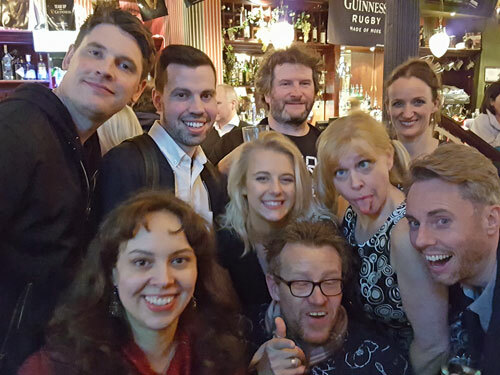 So how did the showcase night at the Comedy Pub (near Leicester Square) go? Taking myself out the equation, I thought everyone on the bill completely nailed their performances — i was on towards the end and watched with trepidation because everyone else’s practising and adrenaline obviously paid off. So, how did my career as a stand-up turn out? You can judge for yourself. 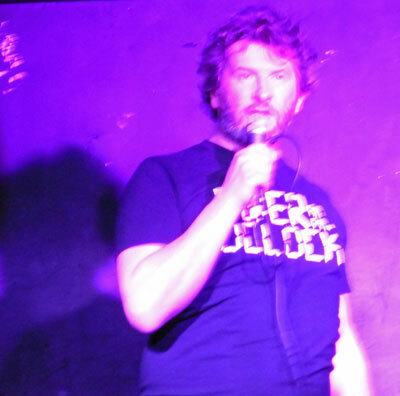 Virtually all of my performance at the Comedy Pub near Leicester Square was recorded on the video below. I couldn’t bring myself to watch it again for a week but then I relented and thought it wasn’t too awful — so put it up on YouTube for posterity. You can actually hear the audience laughing — and in mostly the right places. It was a pretty friendly bunch, generally friends and family of the performers (thanks very much for the great turnout from my supporters). If you listen carefully you can hear my heckler (a Chilean woman who was a friend of one of the other students who was apparently joining in because she liked me!). If you have any comments please leave them at the end of the post. 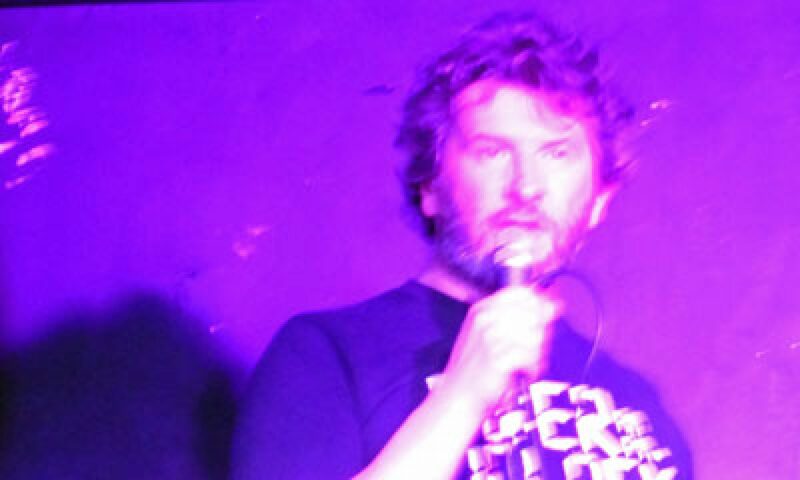 Was that night the beginning and end of my stand-up career? Surprisingly, no. I know I’m not going to be the next Michael McIntyre, nor do I really have the desire to be (for one thing the slog involved in working ones way round the circuit is equivalent to writing a novel — and with a lot less tea and sitting down). Nevertheless, I enjoyed the live performance experience and receiving that instant feedback from the audience , both during the the course and in the showcase itself. In fact, I enjoyed it enough so to subject myself to more! I joined up on Kate’s City Academy follow-on stand-up course, along with five other of the beginners’ course Monday students and others from the parallel Wednesday course, which Kate also taught. Sadly that course has no performance at the end but it’s meant to get students to a standard where they can venture out into the world of stand-up gigging with a five minute set. Will that include me? Watch this space!